Two years ago, I felt rather fortunate to be introduced to the artwork of Australian artist, Shannon Doyle. At the time I was managing an art gallery, so was lucky to be surrounded by amazing artworks every day and be in constant contact with some spectacular artists. Sometimes when you are surrounded by amazing every day, it is harder for new things to ‘wow’ you. That definitely wasn’t the case when I first saw Shannon’s artwork. Not only were his pieces strong to look at, his painting style appealed to my romantic side, using renaissance techniques and showing a strong knowledge of how to use light and shadow. The artworks had somewhat a perfect balance between the past and the modern-day. The subjects were in the world of street art, graffiti and the battle to be accepted as artists. He had taken the modern concept of street art and put it into a fine art form. It really resonated with me so much as it reminds me of quality from times of the past. It also takes the concept of street art which is often so short-lived before it is painted over, to a traditional work on canvas that can be kept forever. A few months later, I ventured back to the world of fashion. I knew I would be one day working with Shannon again, his artwork had to be seen by others, it had something that stuck in my mind and I wanted to be part of that. 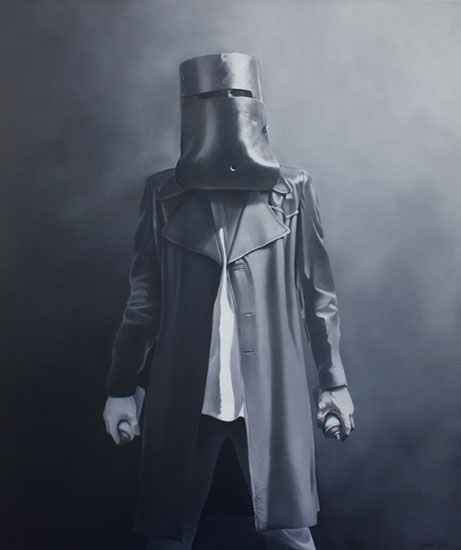 Fast forward to earlier this year, Shannon has since been a finalist and most recently winner, in numerous highly respected art prizes across Australia. I contacted Shannon after being approached for artwork by a fantastic beach side restaurant, Avvia, here on the Gold Coast of Australia. The owners wanted a big, colourful mural and I knew just the person to do it. The process went well and while managing this, I noticed a bond was formed between Shannon and the restaurant owners Eddie and Cherie Uzan, particularly after they visited his beach front studio and saw the works from his current series (quite different to the colourful mural he was commissioned to do). Eddie and Cherie wanted to do an art show at the restaurant combining Eddie’s culinary talent with Shannon’s painting talent. It was called ‘Appetite for Art’ and was a one night pop up interactive exhibition. The restaurant was transformed into a gallery and the outside deck into a studio. The food was spectacular and Shannon painted live and was able to interact with the audience, making for a great night. The guests loved his paintings and when he talked of the stories behind each painting, alongside his techniques, they wanted to hear more. The night was a success and I was overwhelmed with positive feedback in the week following the show, I received so many phone calls, messages and emails from people showing appreciation for his work and the how great the event was. There are plans for another in 2014! I had a chat to Shannon so I could share with you all more about his background and current series. TMHS: When did you start this series? SD: Late in 2011, after a small hiatus to travel and work abroad, I entered the studio with the intention of starting the new series. TMHS: What was your inspiration for the series? SD: I had just returned from travelling and was feeling extremely energised and inspired to paint. I had spent time in Italy, finally seeing the art I had studied for so long in books. I was determined to embrace the techniques I had been taught as a young painter. I was also determined to use these techniques to create work within a contemporary context. I have always been inspired by Mexican Mural art, street art, and graffiti has always been a fascination. One great thing about being an artist is the ability to indulge in and explore these fascinations. TMHS: Tell me more about the Ned Kelly pieces. SD: I have a friend that worked on the film Ned Kelly, featuring Heath Ledger. He managed to acquire one of the replica helmets, which in turn he was kind enough to allow me to borrow for a photo shoot. The concept behind the work is quite simple. At the height of Ned Kelly’s rebellion, he had quite massive public support, almost becoming an icon in his own life time. I can make a connection with contemporary street artists, who even though considered to work out side the law, still have massive public support. TMHS: I’ve been lucky enough to see you paint live a few times now and you never cease to amaze me with your talent. What do you love about painting live? SD: I feel greater connections are made between my art and an audience if that audience can see the work being created in front of them. I have been doing demonstration work for as long as I have been painting and it is not uncommon for people to tell me that they feel inspired to create after seeing the art being made. TMHS: I’ve had so much feedback from the pop-up show at Avvia, with an overwhelming response on how wonderful your artworks are alongside the stories behind them. How does sharing these stories with people help you grow as an artist? SD: I believe the journey from concept to finished painting is an interesting one and I am simply sharing that journey hoping to create a greater understanding of my work. TMHS: Do you listen to music when you paint? If so, what do you listen to? SD: I’m a massive music lover and often have music playing while I work. When I was younger, and painting quite expressive work, I would often listen to loud, fast music. These days, I’m a little more subdued. Regulars on the playlist include Dallas Green (City and Colour), Birds Of Tokyo, Bloc Party, Bon Iver, Foo Fighters, Michael Franti, and I love the Marley’s. Like most people, I think it depends on the mood. SD: I need four! I love my coffee, hate to say… my phone, my dogs and my girlfriend. TMHS: Biggest inspiration on your career as an artist? SD: Wesley Penberthy, my first art teacher. He instilled in me as a young painter an understanding of painting as a discipline, with technique as its foundation. TMHS: Who is your style inspiration, past or present? SD: I haven’t really thought about it, somewhere between street and metro-sexual, I guess. I don’t know Sarah, I do spend most of my time covered in paint. TMHS: What artists do you find inspiring with what they create? SD: I am inspired by a lot of art made by artist from all over the world, but I am most inspired by the artist around me, in particular the boys I went to University with Nic Plowman and Sam Eyles, Brisbane painters. Two very different art making processes, yet equal in their commitment to their art. SD: I have a 1970s Fletcher Jones leather jacket that I found in an op-shop and paid $5.00 for. It has been in circulation the longest… and I can’t forget my Converse All Stars, of course. TMHS: Where can people see your artworks? SD: Online at www.shannondoyleart.com – Also, I am currently showing work through Lorraine Pilgrim Gallery on the Gold Coast. Lorraine has always been a big supporter as well as a great mentor.